Parts of Ivory Coast’s main city of Abidjan resemble a “war zone”, the UN refugee agency head in the West African nation, Jacques Franquin, told the BBC. The UNHCR has suspended plans to open a camp in the west for those fleeing the violence because of safety concerns. “The situation is deteriorating rapidly,” Mr Franquin said. Tensions have been rising since President Laurent Gbagbo refused to hand power to Alassane Ouattara, widely seen as the winner of November’s poll. Mr Franquin comments come as UN peacekeepers in country say they are overstretched and cannot provide security for all civilians. On Thursday, security forces shot dead at least six women marching in support of Mr Ouattara in Abidjan’s northern Abobo neighbourhood. “We are overstretched in terms of patrolling. We conducted over 865 patrols last week. You can’t be in every corner of the city,” UN spokesman Hamadoun Toure told the BBC. 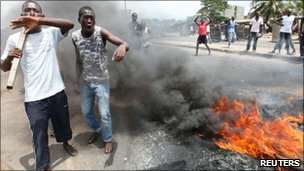 The pro-Ouattara stronghold of Abobo has seen violent clashes for nearly two weeks and the UN estimates some 200,000 people have fled the area. “Certain areas of Abidjan are truly in a situation of war with the population fleeing,” Mr Franquin said. “The situation is making it impossible to reach people who are in need of urgent humanitarian assistance,” he said. In the west, UNHCR staff had been withdrawn to Abidjan for their safety and the agency was trying to set up networks using local non-governmental organisations to help those displaced, he said. A camp is being set up in neighbouring Liberia where tens of thousands have also fled. Meanwhile, Mr Toure said the UN had received two helicopter gunships this week and he hoped the security situation would improve with the arrival of more peacekeepers. The BBC’s international development correspondent Mark Doyle says the delivery of the helicopter gunships is a measure of the seriousness of the situation.The idea that these machines might be used, even in a defensive capacity, in a big overcrowded city like Abidjan takes the situation in Ivory Coast to a new level, he says. African Union heads of state who are attempting to resolve the crisis are due to meet in Mauritania later on Friday. The presidents of Burkina Faso, Chad, Mauritania and South Africa and Tanzania were initially given a month by the AU to do their work. But this week that time frame was extended until the end of March.